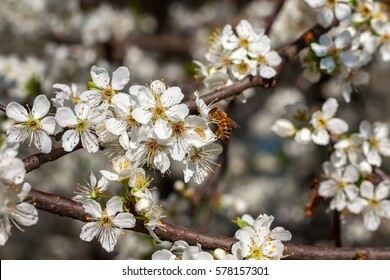 2,697 stock photos, vectors, and illustrations are available royalty-free. 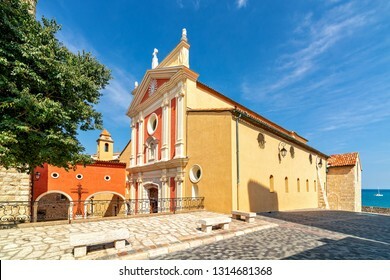 View of Antibes Cathedral on small town square under beautiful blue sky as Mediterranean sea on background in Antibes, France. 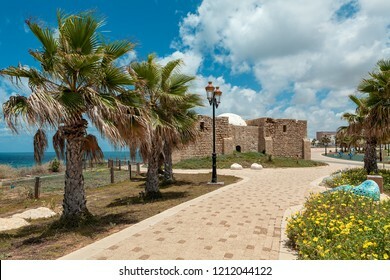 Promenade along Mediterranean sea decorated with palms and flowers as ancient tomb of unknown shah on background in Ashkelon, Israel. 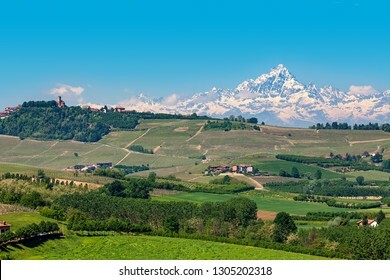 Hills of Langhe with green vineyards as snowy Monviso peak on background under blue sky in Piedmont, Northern Italy. 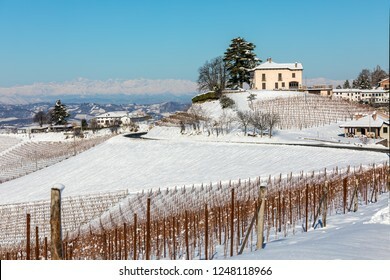 View of rural houses and vineyards on snowy hills under blue sky in Piedmont, Northern Italy. 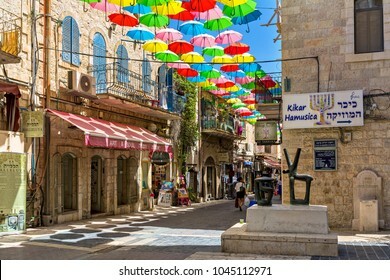 JERUSALEM, ISRAEL - JULY 16, 2017: Multicolored parasols above narrow pedestrian street of Yoel Moshe Salomon in historic Nachalat Shiva district of Jerusalem as part of Umbrellas Street Project. 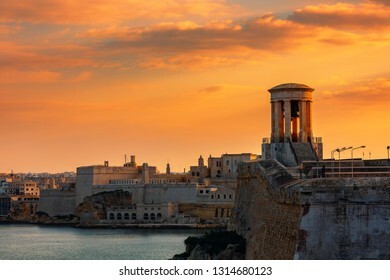 View of Siege Bell War Memorial as old walls and fortress on background under beautiful evening sky in Valletta, Malta. 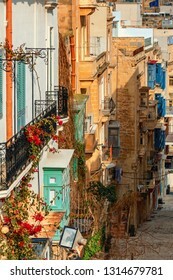 Vertical oriented image of typical stone buildings with colorful balconies along narrow street in Valletta, Malta. 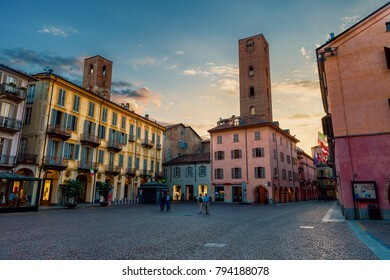 ALBA, ITALY - MAY 25, 2015: View of cobblestone central square of town among old houses and ancient towers in Alba - famous for white truffle festivals and wine production. 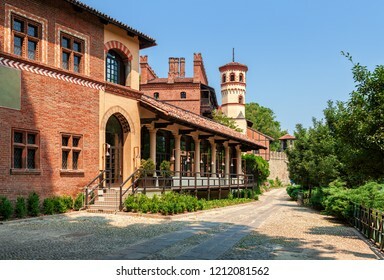 Walkway along reconstructed medieval village in Valentino Park in Turin, Italy. 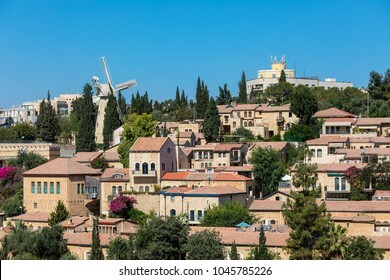 View of Yemin Moshe neighborhood in Jerusalem, Israel. 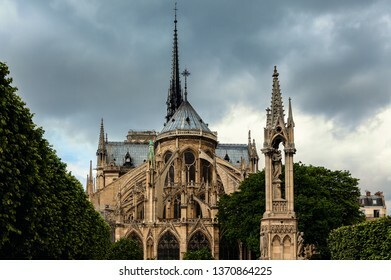 View of Notre-Dame de Paris Cathedral under cloudy sky. 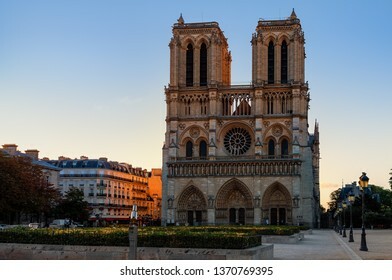 Facade of famous Notre-Dame de Paris cathedral in Paris, France. 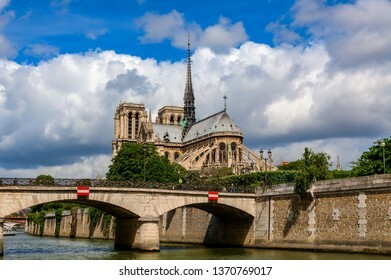 View of bridge over Seine river and famous Notre-Dame cathedral under beautiful sky in Paris, France. 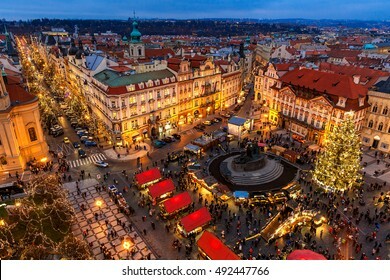 PRAGUE, CZECH REPUBLIC - DECEMBER 10, 2015: View from above on traditional Christmas market at Old Town Square illuminated and decorated for holidays in Prague - capital of Czech Republic. 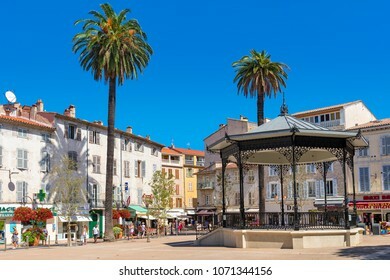 ANTIBES, FRANCE - SEPTEMBER 01, 2017: Bandstand on small town square among palms and houses in Old Town of Antibes - Mediterranean resort on Cote d'Azur in France, pupolar tourist destination. 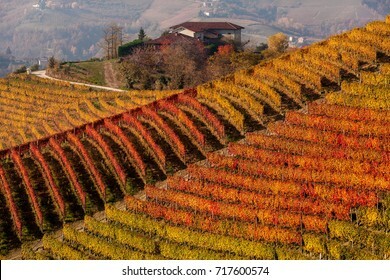 Rows of multicolored autumnal vineyards on the hill in Piedmont, Northern Italy. 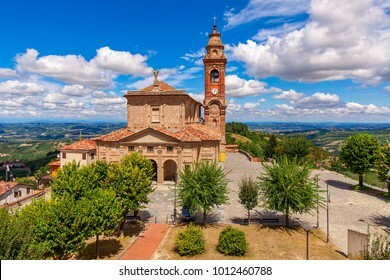 Old brick parish church under beautiful blue sky with white clouds in small town of Diano d'Alba in Piedmont, Northern Italy. 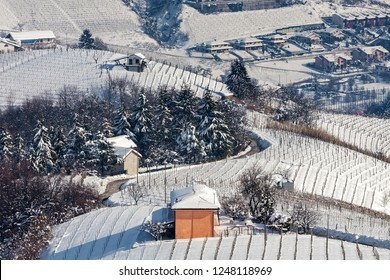 Small rural house on snowy winter hill among vineyards in Piedmont, Northern Italy. 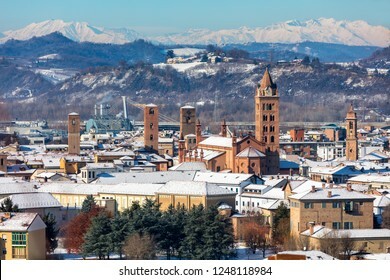 View of old historic center of Alba with cathedral and medieval towers covered with snow in Piedmont, Northern Italy. 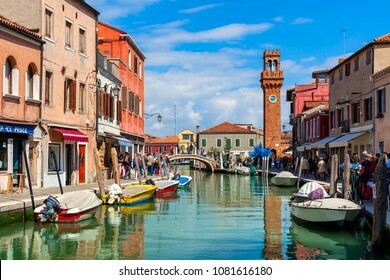 MURANO, ITALY - APRIL 20, 2016: People walking narrow canal with boats among old colorful houses of Murano - famous island in Venetian Lagoon, popular tourist destination. 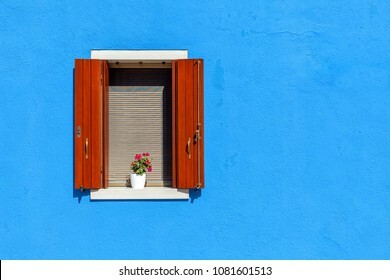 Window with wooden shutters on blue wall in Burano, Italy. 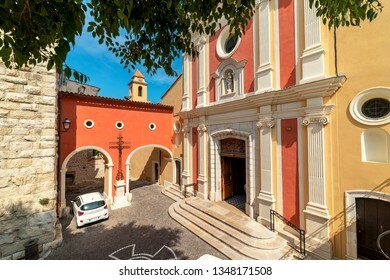 View of Antibes Cathedral on small town square and arched passage in Antibes, France. 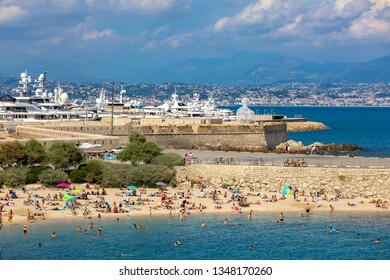 ANTIBES, FRANCE - SEPTEMBER 04, 2018: People on Plage de la Gravette - famous and popular sand beach near the Old Town as marina and luxury yachts on background in Antibes, France. 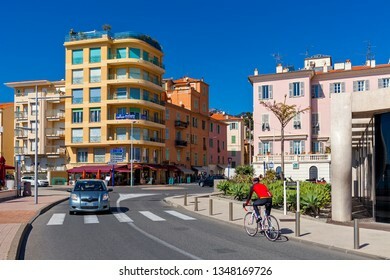 MENTON, FRANCE - MARCH 11, 2017: Urban road along promenade and colorful buildings under blue sky in Menton - small town on Mediterranean coast of French Riviera, popular travel destination. 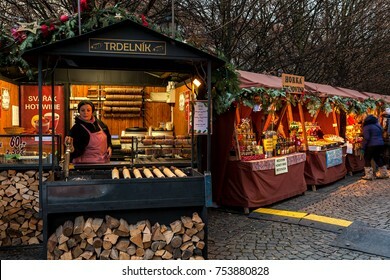 PRAGUE, CZECH REPUBLIC - DECEMBER 12, 2016: Kiosks with souvenirs, hot drinks and traditional trdelnik spit cakes on the strret of Old Town of Prague during famous annual Christmas Market. 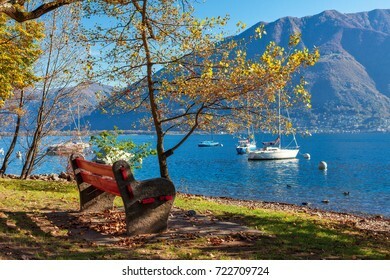 Bench among colorful autumnal trees, yachts on Lake Maggiore and mountains in town of Locarno, Switzerland. 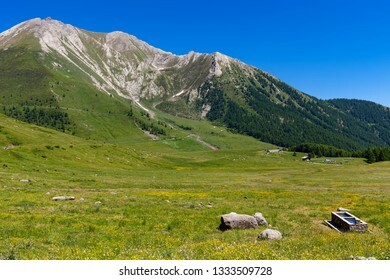 Green alpine meadow and mountains on background under blue sky in Piedmont, Northern Italy. 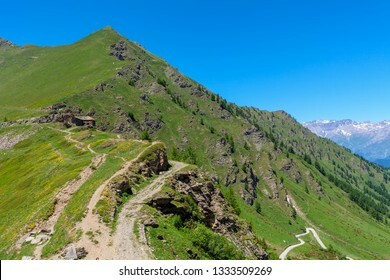 Narrow trail in the mountains at Colle delle Finestre in Piedmont, Northern Italy. 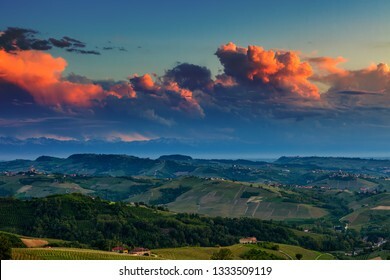 View from above on green hills with vineyards under beautiful evening sky in Piedmont, Northern Italy. 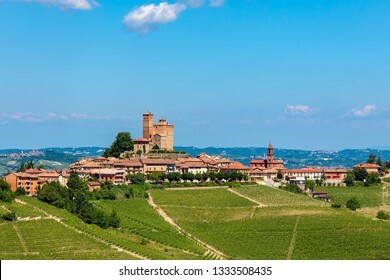 Small medieval twn on the hill with green vineyards under blue sky in Piedmont, Northern Italy. 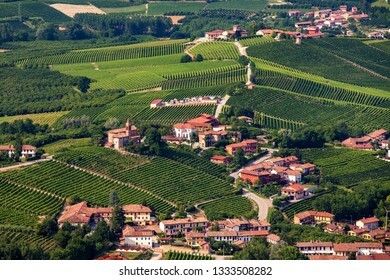 Small town among green vineyards on the hills in Piedmont, Northern Italy. 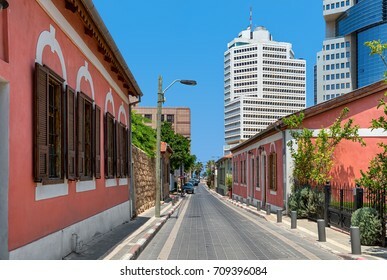 Colorful houses along narrow street as modern buildings on background under blue sky in Neve Tzedek neighborhood in Tel Aviv, Israel. 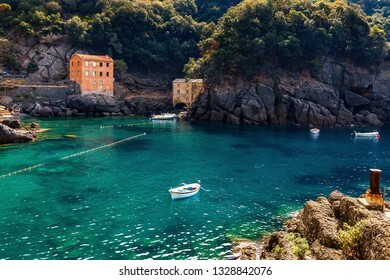 Small bay among rocks at San Fruttuoso, Liguria, Italy. 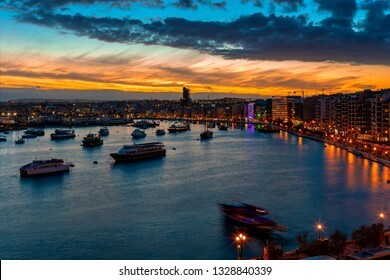 Boats in the bay and illuminated buildings along the shoreline during beautiful sunset in city of Sliema, Malta. 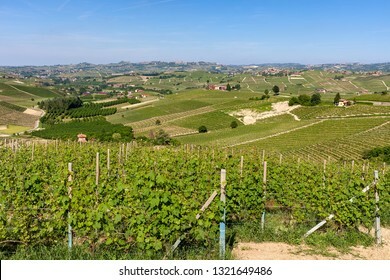 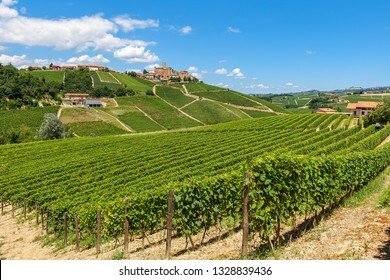 Green vineyards on the hills in Langhe area of Piedmont region in Northern Italy. 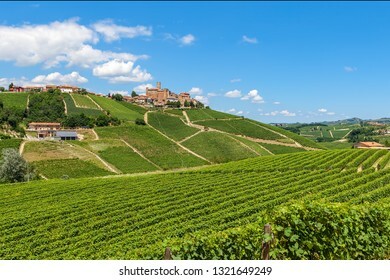 Green vineyards on the hills under blue sky as small town of Castiglione Falletto on background in Piedmont, Italy. 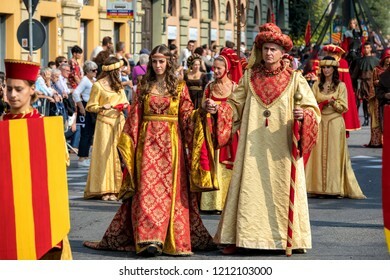 ALBA, ITALY - OCTOBER 01, 2017: People wearing historic dresses on Medieval Parade - traditional part of celebrations during annual White Truffle festival taking place each year in Alba, Italy. 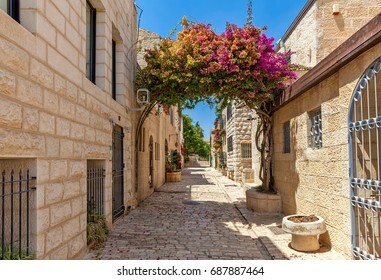 Narrow cobblestone street among stone houses in Yemin Moshe neighborhood in Jerusalem, Israel. 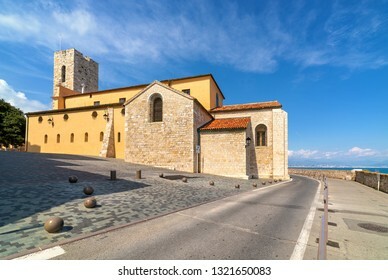 Antibes Cathedral on small town square and road along Mediterranean sea under beautiful blue sky in France. 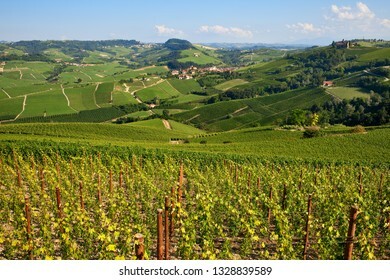 Green vineyards on the hills of Langhe area in Piedmont, Northern Italy. 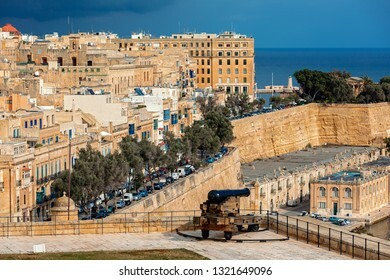 View of old cannon on bastion as city of Valletta on background. 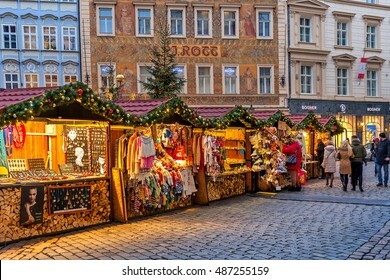 PRAGUE, CZECH REPUBLIC - DECEMBER 10, 2015: Wooden booths offering souvenirs during Christmas market taking place each year on December. 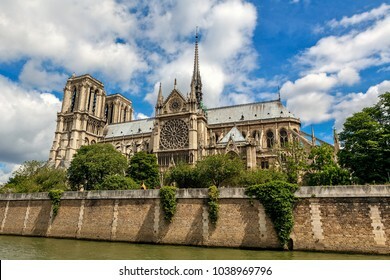 It is very popular destination with tourists visiting Prague. 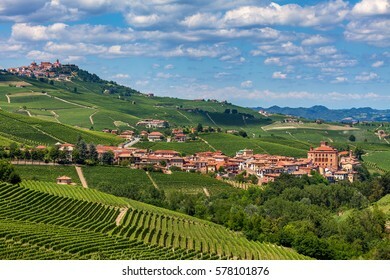 Small town of Barolo among hills and green vineyards in Piedmont, Northern Italy. 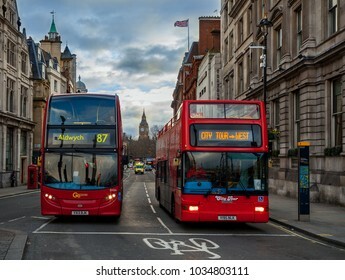 LONDON, UK - JANUARY 12, 2016: Two red modern buses on the street of London - capital and most populous city of United Kingdom, popular tourist destination. 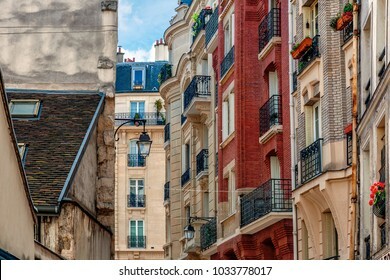 PRAGUE, CZECH REPUBLIC - DECEMBER 10, 2015: Panoramic city skyline, illuminated buildings and Christmas market on Old Town Square in Prague - popular destination with tourists on winter holidays. 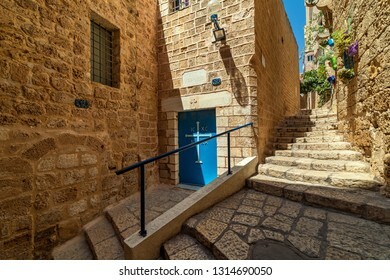 JAFFA, ISRAEL - JULY 18, 2018: Stone stairs on narrow street among medieval walls in small town of Jaffa - ancient port south of Tel-Aviv, popular tourist destination for its beauty and rich history. 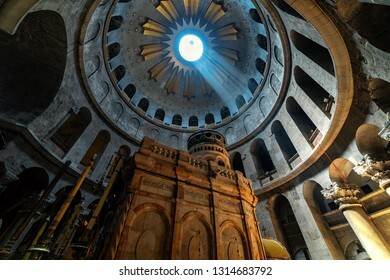 JERUSALEM, ISRAEL - JULY 16, 2018: Ray of sunlight breaks through the ceiling over the tomb of Jesus in the Church of the Holy Sepulchre - sacred place where he was crucified, buried and resurrected. 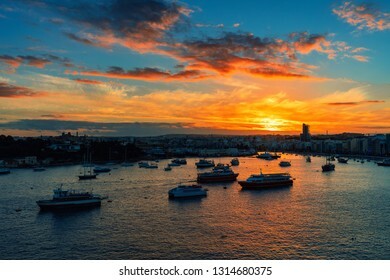 Ships and boats in the bay during beautiful sunset in city of Sliema, Malta. 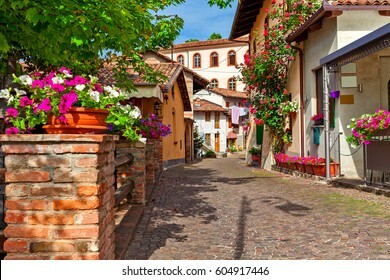 Narrow cobblestone street and typical houses decorated with flowers in town of Barolo, Piedmont, Northern Italy. 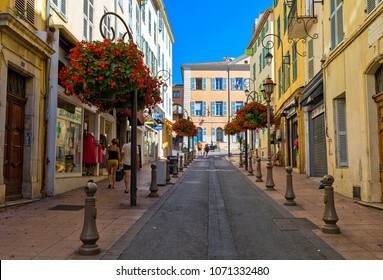 ANTIBES, FRANCE - SEPTEMBER 01, 2017: People walking on narrow street decorated with flowers in Old Town of Antibes - Mediterranean resort on Cote d'Azur in France, pupolar tourist destination. 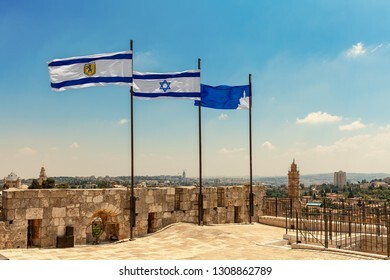 Flags of Israel and of Jerusalem waving on rooftop of the Citadel walls as Tower of David on background in Israel. 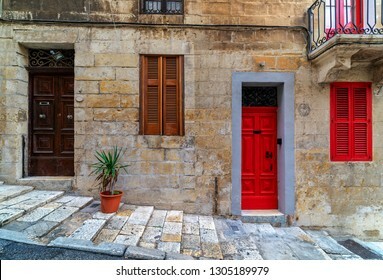 Front view of stone house with typical colorful wooden doors in Valletta, Malta. 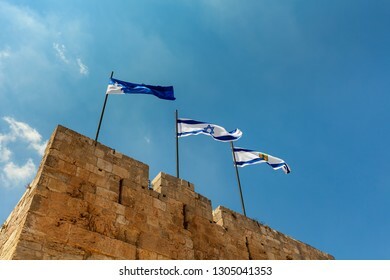 Flags of Israel and of Jerusalem waving on top of the Citadel walls wich surrounding Tower of David in Israel. 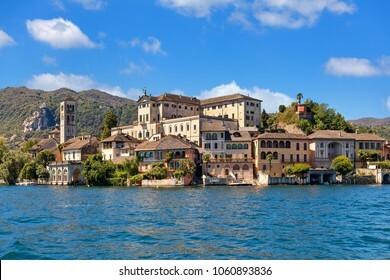 View of monastery on famous San Giulio island on Lake Orta in Piedmont, Northern Italy. 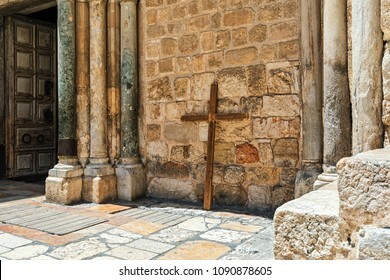 Big wooden cross lean against stone wall of the Church of the Holy Sepulchre in Old City of Jerusalem, Israel. 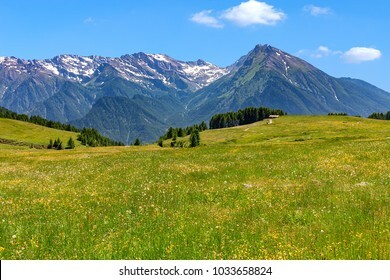 View of green alpine meadow and mountain peaks on background in summer in Piedmont, Northern Italy. 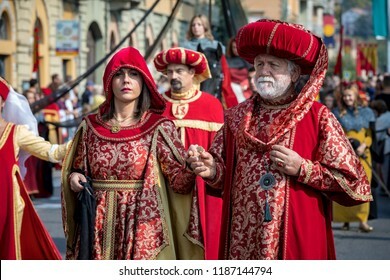 ALBA, ITALY - OCTOBER 01, 2017: People in historic dresses on Medieval Parade - traditional costumed procession as part of celebrations during annual White Truffle festival in Alba, Italy. 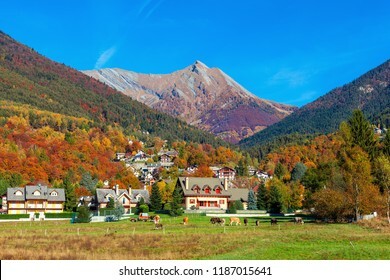 Small village among colorful autumnal hills and mountains under blue sky in Switzerland. 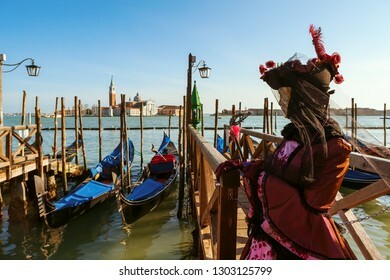 VENICE, ITALY - MARCH 04, 2011: Woman dressed in costume stands near gondolas on Grand Canal as San Giorgio Maggiore on background during traditional famous Carnival taking place in Venice, Italy. 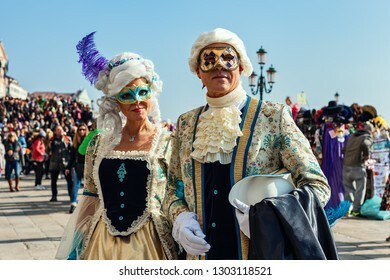 VENICE, ITALY - FEBRUARY 18, 2017: Couple of unidentified participants wear vintage colorful costumes and masks during famous traditional Carnival taking place each year on february in Venice, Italy. 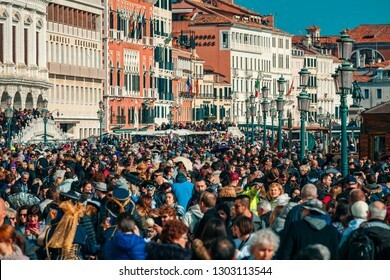 VENICE, ITALY - FEBRUARY 18, 2017: Crowds of tourists walking by typical venetian buildings near San Marco Square during famous traditional carnival taking place each year in Venice, Italy. 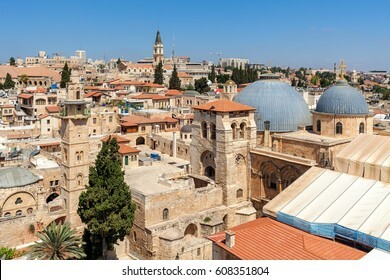 Church of the Holy Sepulchre, domes, minarets and rooftops of the Old City of Jerusalem, Israel as seen from above. 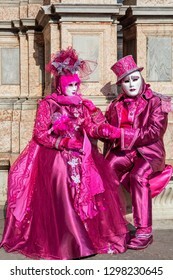 VENICE, ITALY - FEBRUARY 18, 2017: Couple of unidentified participants in vintage colorful costumes and masks during famous traditional Carnival taking place each year on february in Venice, Italy. 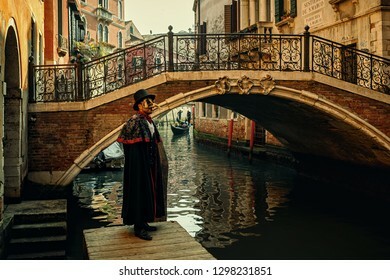 VENICE, ITALY - FEBRUARY 18, 2017: Man dressed in black costume, hat and mask posing in front of small bridge over narrow canal during famous traditional Carnival taking place each year in Venice. 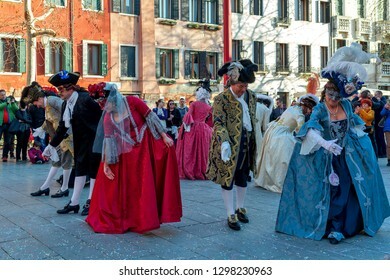 VENICE, ITALY - FEBRUARY 18, 2017: Group of people wearing typical costumes and masks dancing on small square during famous traditional annual carnival taking place each year in Venice, Italy. 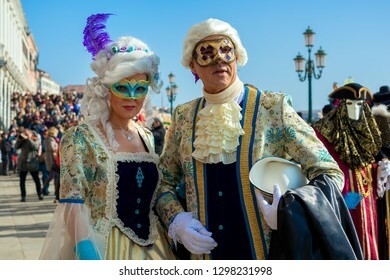 VENICE, ITALY - FEBRUARY 18, 2017: Unidentified participants wear traditional colorful costumes and white masks during famous Carnival taking place each year on february in Venice, Italy. 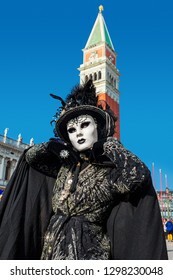 VENICE, ITALY - FEBRUARY 18, 2017: Woman wearing vintage black costume, gloves, hat and white mask posing on San Marco Square during traditional Carnival taking place each year in Venice, Italy. 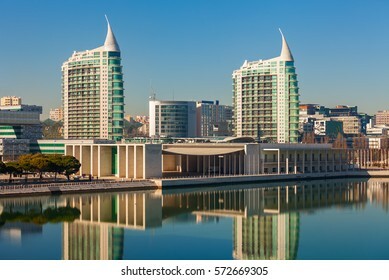 Modern tall residential buildings reflecting in the water under blue sky in Lisbon, Portugal. 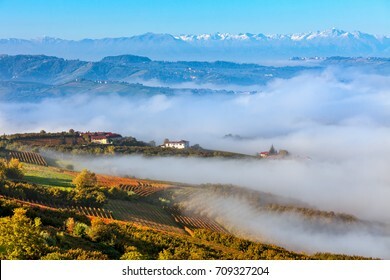 View of hills and vineyards covered with morning fog in autumn in Piedmont, Northern Italy. 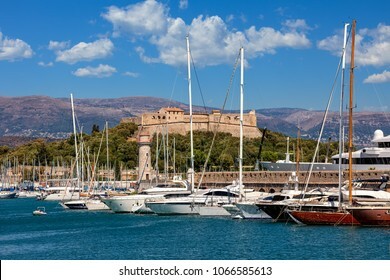 Luxury yachts moored in port of Antibes - famous resort on French Riviera. 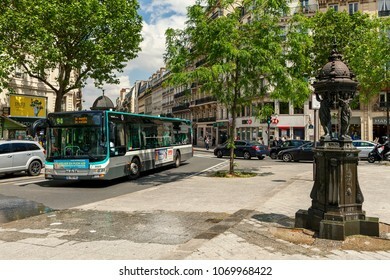 PARIS, FRANCE - MAY 25, 2016: Wallace fountain, public bus and cars on the street of Paris - capital and largest city of France it is also one of the popular travel destinations. 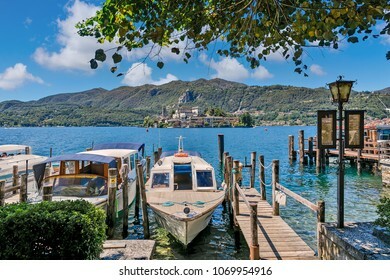 ORTA SAN GIULIO, ITALY - AUGUST 12, 2017: Boats anchored along small wooden pier on Lake Orta - famous and very popular tourist resort and travel destination located in Piedmont, Northern, Italy. 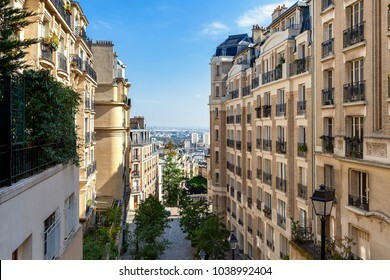 View of residential buildings on Montmartre in Paris, France. 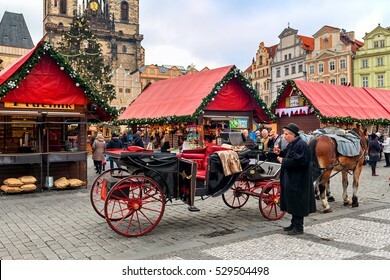 PRAGUE, CZECH REPUBLIC - DECEMBER 10, 2015: Carriage and wooden stalls on Old Town Square during traditional annual Christmas market taking place in december in Prague. 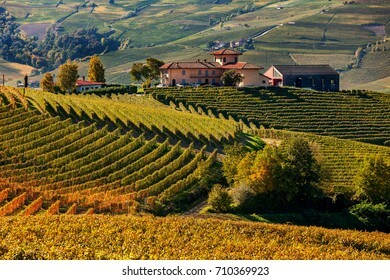 Farm houses and autumnal vineyards on the hills in Piedmont, Northern Italy. 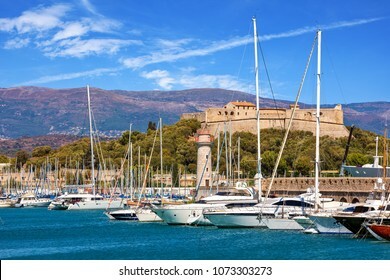 White luxury yachts moored in port of Antibes - -famous city on French Riviera. 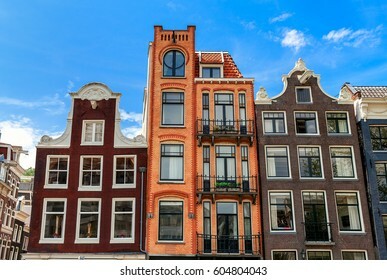 Typical old houses of Amsterdam, Netherlands under blue sky. 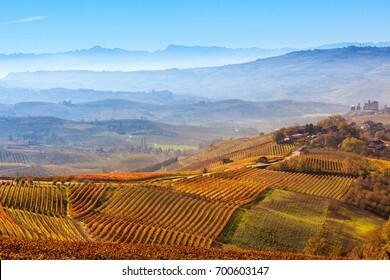 Yellow and orange vineyards and morning fog over the hills on background at autumn in Piedmont, Northern Italy. 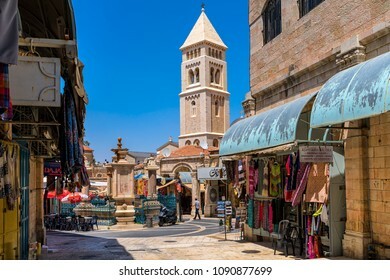 JERUSALEM, ISRAEL - JULY 16, 2017: Small square with fountain among gift shops as belfry on background in Muristan - famous historic complex of streets in Christian Quarter of Old City of Jerusalem. 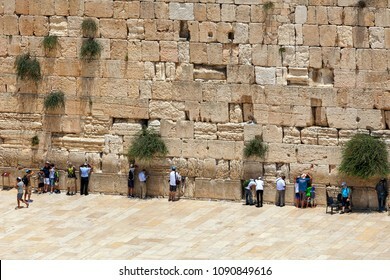 JERUSALEM, ISRAEL - JULY 04, 2016: People praying at Western Wall - ancient wall in Old City of Jerusalem, originally was part of the Second Jewish Temple now is the holiest place in Judaism. 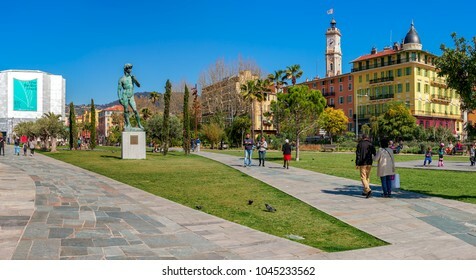 NICE, FRANCE - MARCH 26, 2016: People walking on Promenade du Paillon - 12 hectares and 1.2 kilometres urban park, inaugurated in 2013, popular place with locals and tourists. 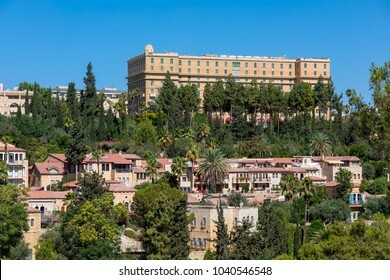 View of the houses of Yemin Moshe neighborhood under blue sky in Jerusalem, Israel. 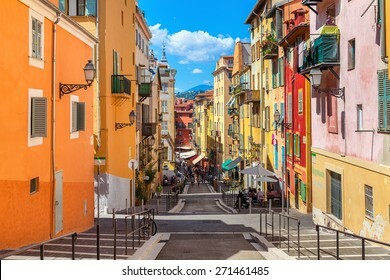 NICE, FRANCE - AUGUST 23, 2014: Narrow street in old part of Nice - fifth populous city and one of the most visited in France, receiving 4 million tourists every year. 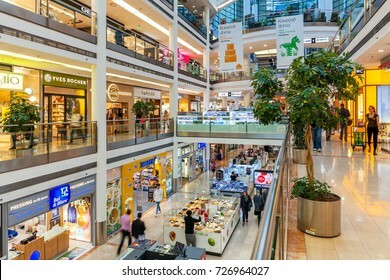 PRAGUE, CZECH REPUBLIC - SEPTEMBER 23, 2015: Palac Flora shopping mall interior view. 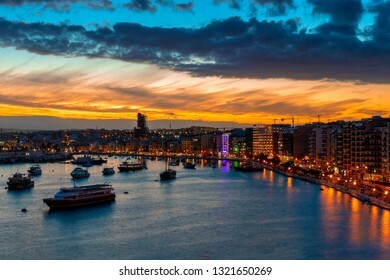 Opened in 2003, contains 4 floors, 120 shops, Cinema City & IMAX theater and is one of largest malls in Prague. 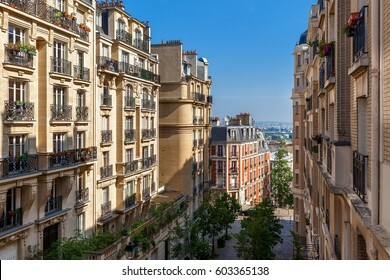 View of typical parisian residential buildings. 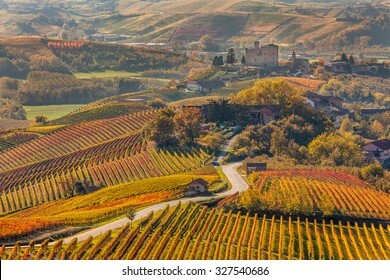 Narrow road through colorful autumnal vineyards in Piedmont, Northern Italy. 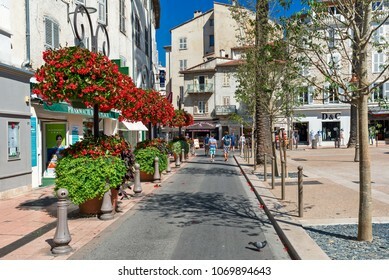 ANTIBES, FRANCE - SEPTEMBER 01, 2017: Narrow street decorated with flowers and plants in Old Town of Antibes - Mediterranean resort on Cote d'Azur in France, pupolar tourist destination. 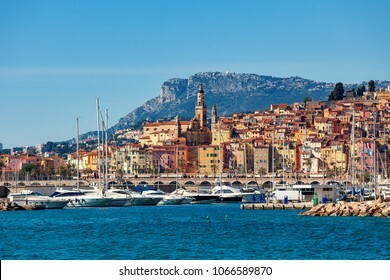 View of small harbor with yachts and old colorful houses of the Old Town on background in Menton - popular tourist resort on French Riviera. 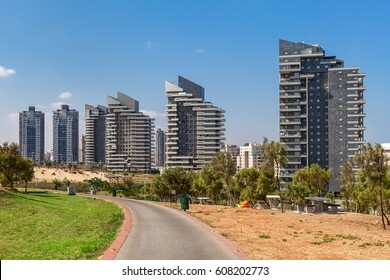 Modern residential complex of buildings under blue sky in Ashdod, Israel. 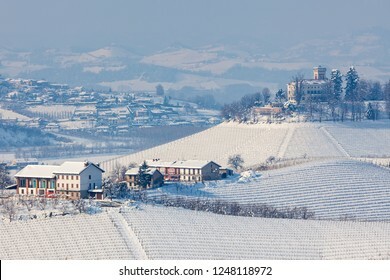 View of snowy hills and vineyards of Langhe region in Piedmont, Northern Italy. 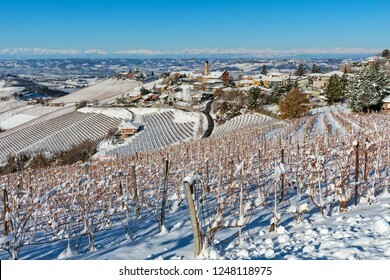 View of vineyards on snowy hills and small town of Treiso on background under blue sky in Piedmont, Northern Italy. 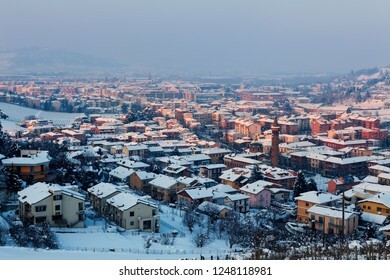 View from above on small italian town of Alba covered with snow in Piedmont, Northern Italy. 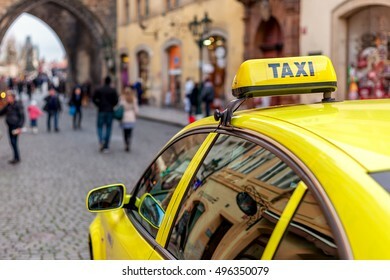 Yellow car with taxi sign on the roof waiting in old town of Prague, Czech Republic (focus on the sign). 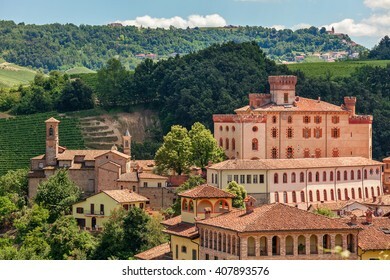 Old town of Barolo among hills in Piedmont, Northern Italy. 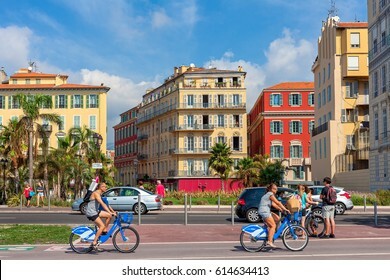 NICE, FRANCE - SEPTEMBER 04, 2016: People on rental city bicycles ride on Promenade des Anglais in Nice - city located on French Riviera, fifth most populous and one of most visited in France.